Hardback. 2nd impression. SIGNED. Memoirs. 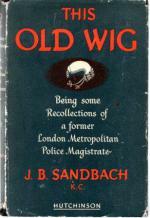 Chapter headings include : The Bar; The Circuit; South Western (includes Brown/Kennedy and their trial for the murder of PC Gutteridge); Lambeth; Marlborough Street; Prostitutes; Shoplifters; Criminals; Police; The Press + much more. With caricature Frontis. by Mr Kenneth Burke, of the Northern Circuit (plus 2 others), Illus. 124pp. small 8vo. h/back. 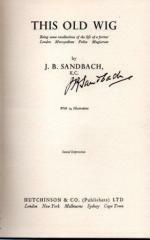 SIGNED BY THE AUTHOR. Minor foxing to edges o/w Nr. F. in frayed and worn G.+ only dw.